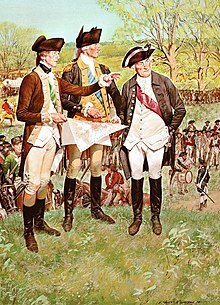 Washington's aides-de-camp during the American Revolutionary War were officers of the Continental Army appointed to serve on General George Washington's headquarters staff, with the rank of lieutenant colonel. The headquarters staff also included one military secretary, a full colonel. An aide-de-camp, General George Washington, and General Artemus Ward at the Siege of Boston. The Second Continental Congress unanimously elected George Washington to the position of Commander-in-Chief of the Continental Army on June 15, 1775. He traveled to Cambridge, Massachusetts, and took command of the Siege of Boston on July 3. His headquarters staff initially consisted of his military secretary, Joseph Reed, and one aide-de-camp, Thomas Mifflin. The responsibilities of the headquarters staff included managing Washington's military correspondence, making copies of each day's General Orders (to be distributed to the commanding officer at each military post), and making copies of individual orders. The 19-year-old artist John Trumbull, who was skilled at drawing maps, was appointed an aide-de-camp on July 27, and served three weeks before being transferred. Congress had authorized one military secretary and three aides-de-camp for the commander-in-chief, but this number soon proved inadequate. Washington's pleas for Congress to authorize two additional aides were ignored, so he augmented his staff with volunteers. Six aides-de-camp – George Baylor, Edmund Randolph, Robert Hanson Harrison, George Lewis, Stephen Moylan, William Palfrey – were appointed between August 1775 and March 1776, some replacing predecessors who had been transferred. Finally, in January 1778, Congress granted the commander-in-chief the power to appoint headquarters staff as he saw fit. On the battlefield, the aides-de-camp were couriers—delivering Washington's orders on horseback and gathering or relaying intelligence on enemy troop movement. Samuel Blachley Webb was wounded at the October 28, 1776 Battle of White Plains and at the December 26, 1776 Battle of Trenton. John Fitzgerald and John Laurens were both wounded at the June 28, 1778 Battle of Monmouth, where Alexander Hamilton's horse was shot from under him. George Johnston served barely 4 months, before dying of disease at the Morristown headquarters. Tench Tilghman served longer than any other aide-de-camp, more than seven years, about half of it as a volunteer. The commander-in-chief's headquarters staff was disbanded on December 23, 1783, when General Washington resigned his commission to Congress, then meeting at Annapolis, Maryland. Aides David Humphreys, David Cobb and Benjamin Walker escorted him to and from the ceremony. Many members of Washington's headquarters staff earned his trust and friendship. Some later served in his presidential administration. In 1906, Worthington Chauncey Ford, chief of the Manuscripts Division at the Library of Congress, published a list of Washington's 32 military secretaries and aides-de-camp. He added Martha Washington as number 33, acknowledging her unofficial clerical help at Washington's headquarters. Frank E. Grizzard, Jr., former editor of The Papers of George Washington: Revolutionary War Series, adds to the list Washington's nephew, George Augustine Washington—a volunteer aide from September 1779 to May 1781, and from December 1781 to May 1782. Joseph Reed (1741–1785) – Served as Gen. Washington's military secretary from June 19 to October 30, 1775. He took leave to prepare a case before the Pennsylvania Supreme Court. Reed rejoined the Continental Army on June 16, 1776, as Adjutant General. Stephen Moylan (1737–1811) – Served as Muster Master General from August 14 to November 1775; and as Gen. Washington's acting-military secretary (in Joseph Reed's absence) from November 1775 to May 1776. He served as a Washington aide-de-camp from March 6 to June 5, 1776, and as a volunteer aide from September 28, 1776 to January 1777. Robert Hanson Harrison (1745–1790) – Served as Gen. Washington's military secretary from May 16, 1776 to March 25, 1781. He had served as a Washington aide-de-camp from November 1775 to May 1776. George Baylor (1752–1784) – Served as an aide-de-camp to Gen. Washington from August 15, 1775 to January 1, 1777. Richard Cary (c.1746–1806) – Served as an aide-de-camp to Gen. Washington from June 21 to December 1776. He was written about kindly by Congressman John Adams to another Massachusetts delegate, William Tudor, judge advocate to the Continental Army, and was appointed a brigade major. :56 Cary resigned to get married. Dr. David Cobb (1748–1830)– Served as an aide-de-camp to Gen. Washington from June 15, 1781 to January 1783, and from June to December 23, 1783. Col. John Fitzgerald (d. 1799) – Served as an aide-de-camp to Gen. Washington from November 1776 to July 1778. Wounded at the June 28, 1778 Battle of Monmouth, he retired from the Continental Army. Capt. Caleb Gibbs (1748–1818) – Commander of Washington's life-guard, he managed the headquarters household accounts from May 16, 1776 to the end of 1780, and served as a supplemental aide-de-camp. Col. William Grayson (1740–1790) – Served as Gen. Washington's assistant secretary from July to August 1776, and served as an aide-de-camp to Gen. Washington from August 24, 1776 to January 11, 1777. Alexander Hamilton (1757–1804) – Served as an aide-de-camp to Gen. Washington from March 1, 1777 to April 1781. Alexander Contee Hanson (1749–1806) – Served as Gen. Washington's assistant secretary from June 21 to September 1776. Robert Hanson Harrison (1745–1790) – Served as an aide-de-camp to Gen. Washington from November 6, 1775 to May 16, 1776, and as Gen. Washington's military secretary from May 16, 1776 to March 25, 1781. David Humphreys (1752–1818) – Served as an aide-de-camp to Gen. Washington from June 23, 1780:262 to December 23, 1783. After the war, he was private secretary to Washington at Mount Vernon, and secretary to President Washington in New York City, 1789-90. John Laurens (1754–1782) – Served as volunteer aide from August 9 to September 6, 1777 when he was appointed an extra aide-de-camp. He was officially appointed aide-de-camp to Gen. Washington on October 6, 1777 and held that position until March 29, 1779 when Congress commissioned him to travel home to South Carolina and attempt to recruit a regiment of slaves. On behalf of the United States, Laurens traveled to Europe and negotiated a 10 million livre loan from the Netherlands, to be guaranteed by France. He returned to the United States in September 1781, rejoined General Washington at the Siege of Yorktown, and helped to negotiate the surrender of British General Cornwallis. He returned to South Carolina in November 1781, and died nine months later in the Battle of the Combahee River. George Lewis (1757–1821) – Gen. Washington's nephew. A volunteer aide from November 1775 to December 1776. Appointed a lieutenant in the commander-in-chief's life guards in May 1776, he transferred to the 2nd Continental Dragoons in December 1776. Dr. James McHenry (1753–1816) – Served as an aide-de-camp to Gen. Washington from May 15, 1778 to August 1780. An Irish-born Philadelphia medical student, he served as a surgeon early in the war. Left to join the staff of the Marquis de Lafayette. Richard Kidder Meade (1746–1805) – Served as an aide-de-camp to Gen. Washington from March 12, 1777 to November 1780; supervised the October 2, 1780 execution of British Major John André. Thomas Mifflin (1744–1800) – Served as an aide-de-camp to Gen. Washington from June 19 to August 14, 1775, when he was promoted to Quartermaster General. Stephen Moylan (1737–1811) – Served as an aide-de-camp to Gen. Washington from March 6, 1776 to June 5, 1776, and as a volunteer aide from September 28, 1776 to January 1777. William Palfrey (1741–1780) – Served as an aide-de-camp to Gen. Washington from March 6 to April 1776. Edmund Randolph (1753–1813) – Served as an aide-de-camp to Gen. Washington from August 15 to November 2, 1775. Col. William Stephens Smith (1755–1816) – Served as an aide-de-camp to Gen. Washington from July 6, 1781 to June 1782. Tench Tilghman (1744–1786) – A Maryland militiaman who spoke fluent French, he served as an aide-de-camp to Gen. Washington for more than 7 years (longer than anyone else). A volunteer aide from August 8, 1776 to June 21, 1780, Washington confirmed his special status in General Orders. He was appointed an aide-de-camp to Gen. Washington on June 21, 1780 and served until November 1783. On June 5, 1781, at Washington's request, Congress awarded Tilghman the rank of Lieutenant Colonel, dating his military commission retroactively to April 1, 1777. John Trumbull (1756–1843) – Served as an aide-de-camp to Gen. Washington from July 27 to August 15, 1775. Richard Varick (1753–1831) – Served as Gen. Washington's records secretary from May 25, 1781 to mid-December 1783. Benjamin Walker (1753–1818) – Served as an aide-de-camp to Gen. Washington from January 25, 1782 to December 23, 1783. John Parke Custis (1754–1781) – Gen. Washington's step-son. A volunteer aide from October to November 1781, including during the Siege of Yorktown. Died of camp fever, November 5, 1781. John Hopwood (1745–1802) – Family tradition holds that Hopwood was an aide to Gen. Washington. Albert Pawling (1750–1837) – A family history claims he was an aide-de-camp to Gen. Washington. Major Albert Pawling was an officer in Malcolm's Additional Continental Regiment, and tendered his resignation on February 25, 1779. Washington tried to persuade him to reconsider, but was unsuccessful. ^ a b c d e f Lefkowitz, Arthur S. (2003). George Washington's Indispensable Men: The 32 Aides-de-Camp who Helped Win American Independence. Stackpole Books. ISBN 978-0-8117-1646-8. ^ a b c Ford, Worthington Chauncey, ed. (1906). List and Writing of Washington's Aids-de-Camp and Secretaries. Calendar of the Correspondence of George Washington with the Continental Congress. Washington: Library of Congress. p. 9. ^ a b c d e Fitzpatrick, John C. (January 1923). "The Aides-de-Camp of General George Washington". Daughters of the American Revolution Magazine. 57 (1). ^ "George Washington to William McIntosh". Founders Online. National Archives: see note. October 21, 1776. ^ a b Washington, George (July 27, 1775). "General Orders". Founders Online. National Archives. ^ a b c d Washington, George (August 15, 1775). "General Orders". Founders Online. National Archives. ^ a b c "John Adams to George Washington". Founders Online. National Archives. June 19–20, 1775. ^ "Elbridge Gerry to George Washington". Founders Online. National Archives. January 13, 1778. ^ a b "1775 ? 2018 Inflation Calculator". FinanceRef Inflation Calculator. Alioth Finance. January 15, 2018. ^ "George Washington to Jonathan Trumbull, Jr". Founders Online. National Archives. May 14, 1781. ^ "George Washington to the Continental Congress Camp Committee". Founders Online. National Archives. January 29, 1778. ^ "John Laurens to George Washington". Founders Online. National Archives. June 28, 1778. ^ a b c Washington, George (July 22, 1775). "General Orders". Founders Online. National Archives: note 2. ^ a b c Fore, Samuel K. (2012). Stoltz, Joseph F., III (ed.). "Tench Tilghman". George Washington Digital Encyclopedia. Mount Vernon Estate. ^ a b Washington, George (June 19, 1775). "Diary Entry". Founders Online. National Archives: see note. ^ "George Washington to Joseph Reed". Founders Online. National Archives: note 1. October 30, 1775. ^ "George Washington to Joseph Reed". Founders Online. National Archives: note 1. April 23, 1776. ^ a b Washington, George (August 14, 1775). "General Orders". Founders Online. National Archives. ^ a b c d Washington, George (May 16, 1776). "General Orders". Founders Online. National Archives. ^ "George Washington to Robert Hanson Harrison". Founders Online. National Archives. March 25, 1781. ^ Washington, George (June 8, 1781). "General Orders". Founders Online. National Archives. ^ Washington, George (May 14, 1782). "General Orders". Founders Online. National Archives. ^ "Benjamin Lincoln to George Washington". Founders Online. National Archives: note 1. July 15, 1784. ^ "George Washington to George Baylor". Founders Online. National Archives: note 1. January 9, 1777. ^ a b c Washington, George (June 21, 1776). "General Orders". Founders Online. National Archives: note 1. ^ Richard Cary married Anna Low, of New York, December 20, 1776, in Philadelphia. See Ford, Worthington Chauncey, ed. (1893). "Richard Cary to Samuel Webb [December 22, 1776]". Correspondence and Journals of Samuel Blachley Webb, Vol. 1. New York: Wickersham Press. pp. 175–76. ^ Washington, George (June 15, 1781). "General Orders". Founders Online. National Archives. ^ "David Cobb to William Heath". Founders Online. National Archives. June 15, 1783. ^ a b c "George Washington to Robert Morris". Founders Online. National Archives: note 5. January 4, 1784. ^ "Alexander Hamilton to Elias Boudinot". Founders Online. National Archives: note 14. July 5, 1778. ^ Washington, George (July 2, 1781). "General Orders". Founders Online. National Archives. ^ "George Washington to New York Committee of Safety". Founders Online. National Archives: note 2. May 6, 1776. ^ Washington, George (August 24, 1776). "General Orders". Founders Online. National Archives. ^ "George Washington to William Grayson". Founders Online. National Archives. January 11, 1777. ^ Washington, George (March 1, 1777). "General Orders". Founders Online. National Archives. ^ "Alexander Hamilton to George Washington". Founders Online. National Archives. April 27, 1781. ^ Washington, George (November 6, 1775). "General Orders". Founders Online. National Archives. ^ Washington, George (January 20, 1777). "General Orders". Founders Online. National Archives. ^ "George Washington to John Laurens". Founders Online. National Archives: note 1. August 5, 1777. ^ a b Washington, George (September 6, 1777). "General Orders". Founders Online. National Archives: note 1. ^ "Founders Online: General Orders". 6 October 1777. Retrieved 2018-02-22. ^ "Thomas Nelson to George Washington". Founders Online. National Archives: note 1. March 23, 1779. ^ "Henry Laurens to George Washington". Founders Online. National Archives: note 2. March 19, 1779. ^ "C.W.F. Dumas to John Adams". Founders Online. National Archives: note 1. November 28, 1781. ^ "John Laurens to Anonymous". Founders Online. National Archives. September 24, 1781. ^ "George Washington to Thomas McKean". Founders Online. National Archives. October 19, 1781. ^ "George Lewis". George Washington Digital Encyclopedia. Mount Vernon Estate. Retrieved 2017-12-19. ^ a b "Fielding Lewis to George Washington". Founders Online. National Archives: note 1. November 14, 1775. ^ Washington, George (May 15, 1778). "General Orders". Founders Online. National Archives. ^ "Marquis de Fleury to Alexander Hamilton, 1778". Founders Online. National Archives: note 2. ^ Washington, George (March 12, 1777). "General Orders". Founders Online. National Archives. ^ a b Washington, George (March 6, 1776). "General Orders". Founders Online. National Archives. ^ Washington, George (June 7, 1776). "General Orders". Founders Online. National Archives: note 2. ^ "George Washington to John Hancock". Founders Online. National Archives. January 22, 1777. ^ "Pierre Penet to George Washington". Founders Online. National Archives. August 3, 1776. ^ "George Washington to John Hancock". Founders Online. National Archives: note 2. October 7, 1776. ^ "George Washington to John Hancock". Founders Online. National Archives. November 2, 1775. ^ Washington, George (July 6, 1781). "General Orders". Founders Online. National Archives. ^ "George Washington to William Stephens Smith". Founders Online. National Archives. June 24, 1782. ^ "Peter Presley Thornton". Library Thing. ^ Washington, George (September 17, 1776). "General Orders". Founders Online. National Archives. the General’s Orders are delivered by the Adjutant General, or one of his Aid’s-De-Camp, Mr Tilghman, or Col. Moylan the Quarter Master General. ^ Washington, George (June 21, 1780). "General Orders". Founders Online. National Archives. ^ Washington, George (June 5, 1781). "General Orders". Founders Online. National Archives. ^ "George Washington to Richard Varick". Founders Online. National Archives. May 25, 1781. ^ "George Washington to Richard Varick". Founders Online. National Archives: note 2. January 1, 1784. ^ Washington, George (January 25, 1782). "General Orders". Founders Online. National Archives. ^ Washington, George (February 19, 1777). "General Orders". Founders Online. National Archives. ^ Ford, Worthington Chauncey, ed. (1893). "George Washington to Samuel B. Webb [January 11, 1777]". Correspondence and Journals of Samuel Blachley Webb, Vol. 1. New York: Wickersham Press. p. 181. ^ Peter Bowman at Find a Grave. ^ Wiley, Samuel T., ed. (1889). "William H. Hopwood, M.D.". Biographical and Portrait Cyclopedia of Fayette County, Pennsylvania. Chicago: John M. Gresham & Co. p. 349 – via Internet Archive. ^ Lockwood, Mary S. (1908). "Mrs. Susan McCulloch". Lineage Book of the Charter Members of the National Society of the Daughters of the American Revolution. Washington, D.C.: D.A.R. p. 99. ^ Col. Albert Pawling at Find a Grave. ^ Kitts, Katherine Wallace (1903). Henry Pawling and Some of His Descendants. Privately printed. p. 19. ^ "Maj. Albert Pawling to George Washington". Founders Online. National Archives. February 25, 1779. This page was last edited on 22 July 2018, at 02:04 (UTC).